I am really getting into the swing of painting 6mm now. 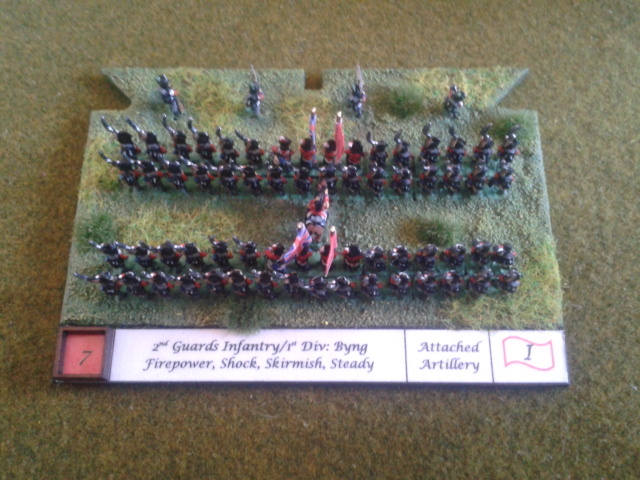 I finished off my second base for Blücher, being Byng's 2nd Guard Brigade. During Waterloo these chaps defended Hougoumont, and defended it well. Sorry for the crap pictures, but the camera gave up the ghost in France the other week and these were taken on my phone. Thank you, I have always wanted the 'big battle' experience of Napoleonics, so Blucher is perfect for that. I have WW1 and 2 for skirmish games and below battalion level, so Napoleonics for Brigade and above works perfectly for me! 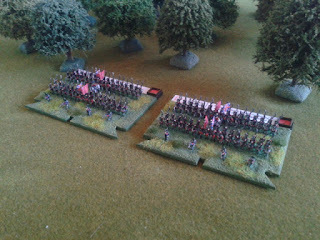 I am currently re basing all my 6mm armies for Blucher. Its nice to see how other wargamers are doing them. 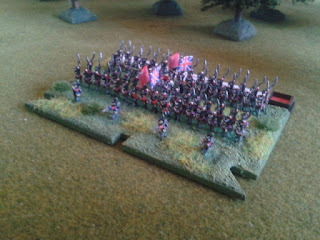 Could you tell me where you got the actual Blucher shaped base from please. OK, I have the Mini-bit stuff with dice, but how did you make and print the information on the back of the base? I cannot seem to get the correct font. I made a Word document with a table with cell heights and widths which fitted the size of the space on the rear of the base. I wrote the information in each table cell from the 100 Days Campaign Cards that Honour produce. Once I had printed out the pages, I laminated the entire page and cut each base label out individually. The font is Lucida Calligraphy, which I think, comes with Word anyway and looked to me like a handwritten Napoleonic style. Any would work, any that look good to you!